I met Andrew at a Hobart waterfront boat display and we just got talking (as you do) and from their my sons photography business needed some framing services and we just moved along from that to creating his website. Today I keep in brief contact, his WordPress site auto updates and every now and then I take a peek and offer advice or provide quick updates as all part of providing help to friends. It has auto feed from Facebook and this allows for some constant new content. 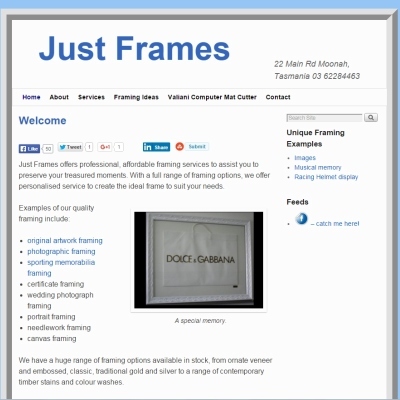 The website has proved very effective fro his business.